I have no internet, may have Ebola and where I live is like Africa. Clara is such a lucky gal. I had to check this out in terms of what percentage of his wealth that is. I last heard he was worth $40b so using that as a starting point, he donated 0.000625% of his total wealth. That’s like someone who is worth $10m donating $6250. Not even a drop in the ocean, yet the guy thinks that Zuckerberg “obliterated” the guy. If that guy is worth $1m, if he donates just $625 he’ll have equaled Mark’s contribution. 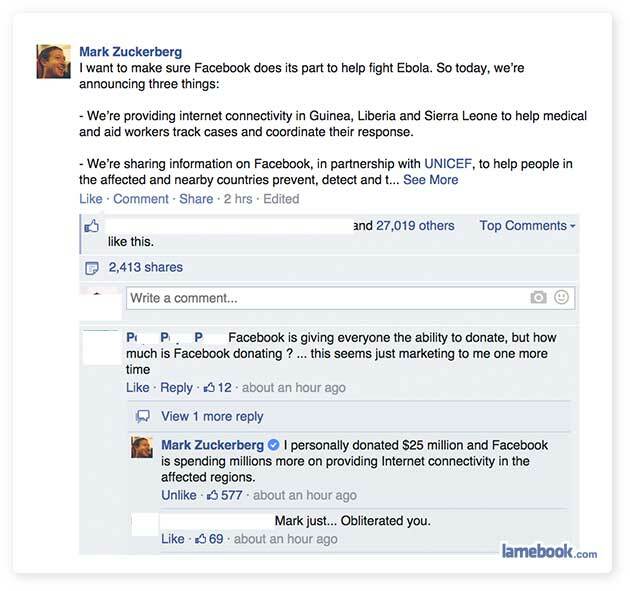 So please, let’s not think Zuckerberg is doing something amazing. It’s all relative.